Is "Natural Coffee" Healthier For You? I hope you didn't think I was going to answer that question in the first paragraph. I'm here to talk about coffee, gotta keep your attention! So, "natural" coffee--what's does that mean? You might hear a barista say, "Oh yeah, we have a really nice natural right now, it's so juicy." If you aren't familiar, that probably sounds pretty weird. Let's break it down. I've said it before but I'll say it again: coffee is a fruit! You know, you know, looks like a cherry, grows on a tree. We roast, grind, and brew the seeds (which we bafflingly call "beans") and drink a sort-of seed juice at the end of all of it. And the taste of that "seed juice" depends A LOT on how much contact the seeds had with the coffee fruit. There are two main ways to process coffee cherries: washed and natural. Washed is also called "wet-processed" coffee, and natural coffee is often called "dry-processed." The washed process is newer, developed in the 19th century. If you're wondering whether a washed coffee is cleaner somehow, read this and come back. 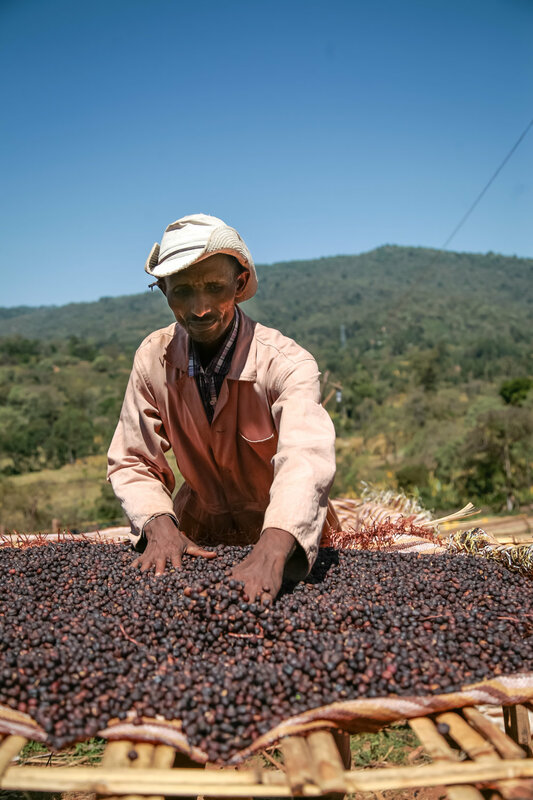 Natural processing is the traditional way of producing coffee, passed down from Ethiopia and replicated in countries like Brazil, Haiti, India, and Ecuador. It is the simplest way of processing coffee: cherries are picked off the branch while ripe, then laid out on raised, screen-covered beds or concrete patios. The coffee is rotated periodically so it dries evenly on all sides. Once it's dry, the raisin-like pods are sent through a crusher and the fruit, which has fermented and dried inside the skin, comes most of the way off. If this sounds shorter and easier than the washed process, that's because it is. It takes way less water, and way less moving the coffee around from tank to tank. For producers short on capital and labor, natural processing is often the only option. However, naturals are a little riskier than washed coffees because they love to rot, especially in humid climates. But natural coffees that make it through careful drying and sorting are some of the most delicious and unique in the end! Drying coffee in its fruit sends alllllll that yummy fruity goodness into the seed, producing some exquisite flavors that you would never expect from coffee. The first natural I ever had was Ethiopian Ardi, and it's a fruit bomb! The flavors change subtly from season to season (depends on rainfall), but Ardi is always juicy and slightly tart, like strawberries or blueberries. One year it was a little fuller and sweeter, like plums. Some people do not like the taste of natural coffees, because they can be a bit earthy. Natural coffees also used to be considered low quality due to poor harvesting and drying techniques. In recent years we've seen a Natural Renaissance due to the rise of single-origins and direct trade practices. With meticulous drying and sorting, farms are now producing some extremely tasty naturals. To sum it all up, no, natural coffee is not healthier for you. It's also not necessarily organic, or fair trade, or certified in any way. It's just dried differently, in a way that produces significant fruit flavors. My advice: Try a few naturals from an assortment of origin countries (Ethiopia, Sumatra, Brazil, Guatemala, etc.) before deciding whether you like this processing or not!